R&B crooner Solomon Burke was inducted in the Rock and Roll Hall of Fame in 2001. 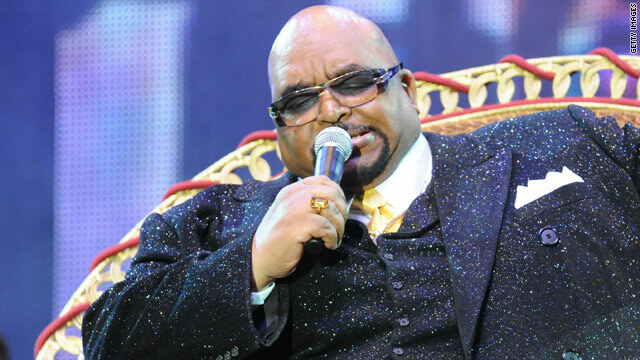 His hits include "Got to Get You Off of My Mind" and "Tonight's the Night"
Burke was once hailed as "the greatest soul singer of all time"
(CNN) -- Soul singer Solomon Burke has died at the age of 70 in the Netherlands, his Dutch representative said Sunday. Burke died of natural causes after arriving at Amsterdam's Schiphol Airport, his family said in a statement posted on Burke's website. He was in town to perform for a sold-out show with the Dutch band De Dijk. "This is a time of great sorrow for our entire family. We truly appreciate all of the support and well wishes from his friends and fans. Although our hearts and lives will never be the same, his love, life and music will continue to live within us forever," his family said. Hailed by Atlantic Records producer Jerry Wexler as "the greatest soul singer of all time," Burke was inducted into the Rock and Roll Hall of Fame in 2001. He joined the Atlantic Records stable in 1960, putting him in the company of Ray Charles, Ben E. King and Wilson Pickett. His first hit with them came almost immediately, with "Cry to Me." He had top R&B hits in 1965 with "Got to Get You Off of My Mind," and "Tonight's the Night," the rock museum says in Burke's biography. He continued to tour until his death, and was scheduled to perform Tuesday in Amsterdam, the Netherlands.